Frisco Kids: Review: Newseum in Washington D.C.
Be a Reporter: Reading your news, weather or sports story into the camera (your choice of backdrop). 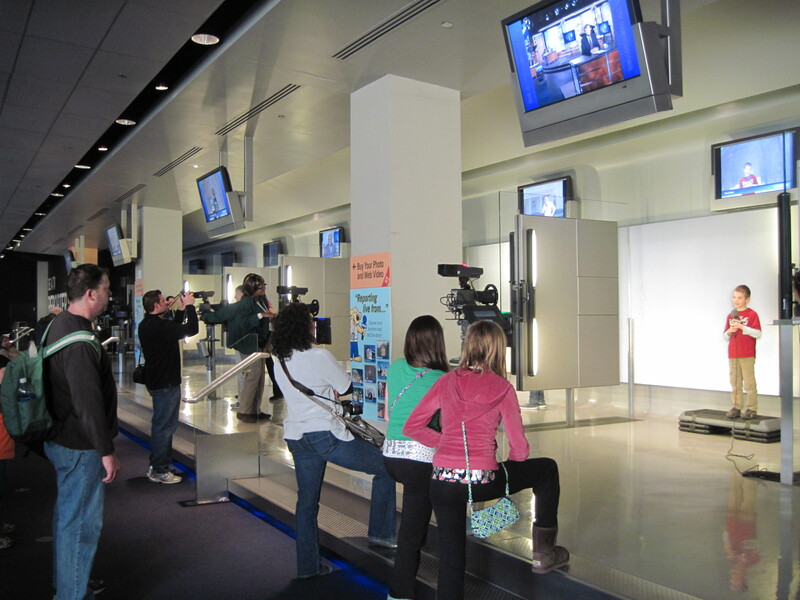 For $5, you get a (cheap) photo of you on TV, and instructions on accessing the video online. (If I'm able to permanently download it, I'll post the link here. For now, I can only figure out how to access it for 30 days). The kids had a great time doing this, and Dori loved that her blue shirt was the same color as the screen, and her shirt essentially disappeared on camera. 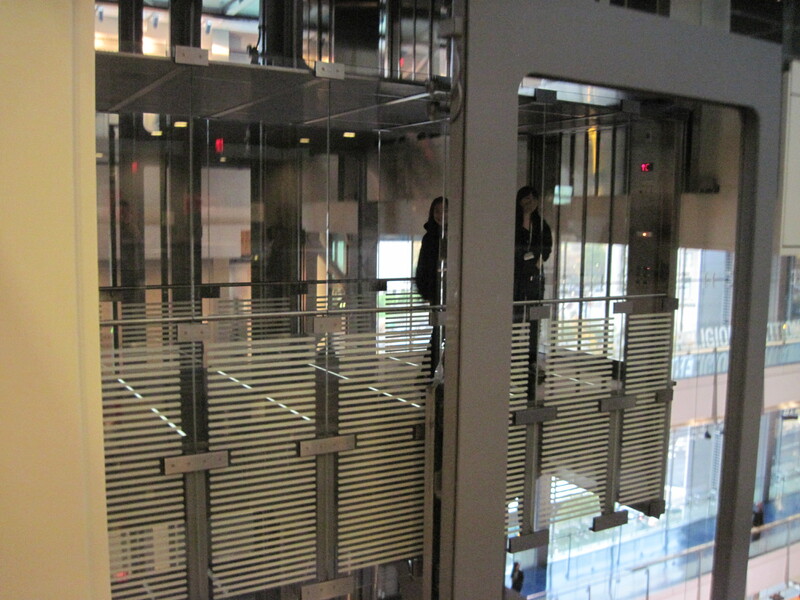 The Elevator – not kidding! 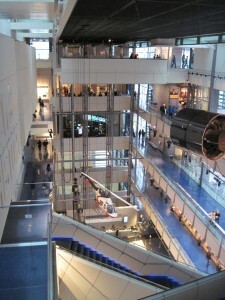 The huge, glass express elevator takes you from the concourse (basement) to the 6th floor, giving you museum information along the way. We rode it several times. Because we could. 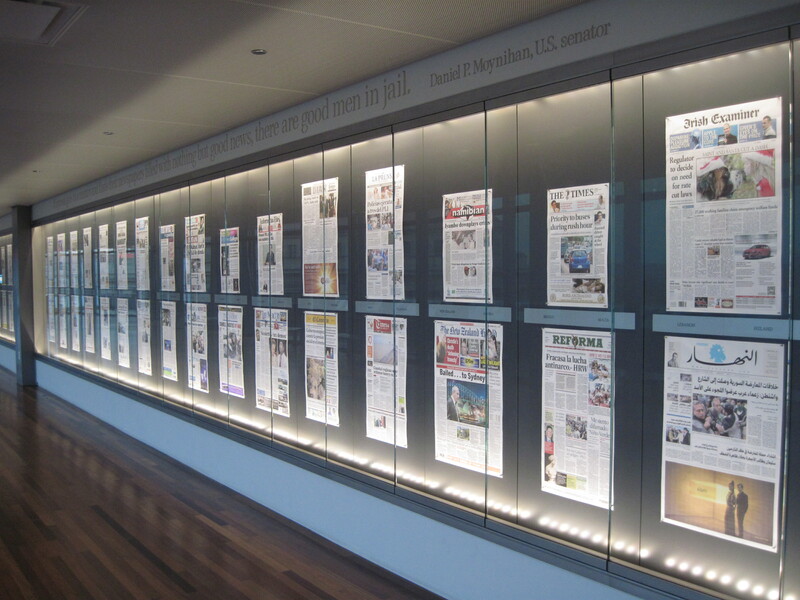 Front Pages Gallery – see that day’s newspaper front pages from around the world (outside and also on the 5th floor). Capitol View – great photo ops on the 6th floor with the capitol in the background. Holiday photo! 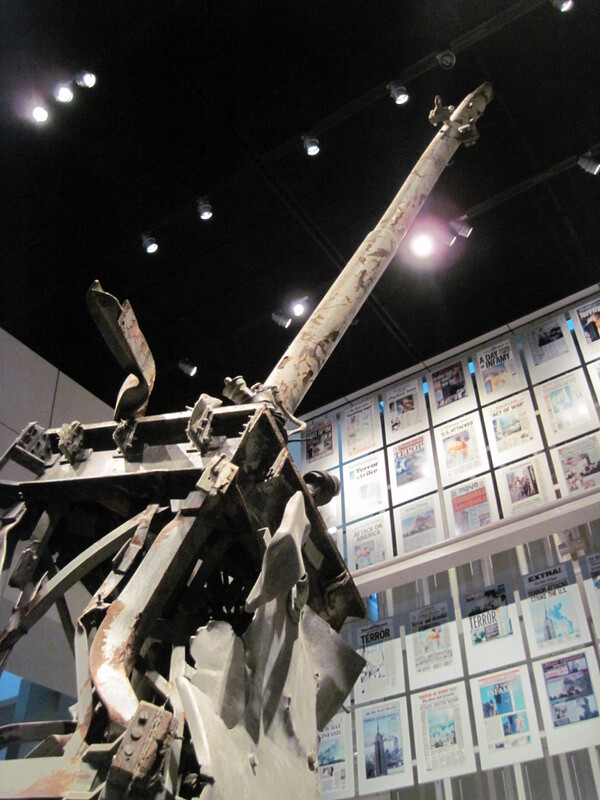 9/11 Gallery – skip this if your kids aren’t aware of 9/11. They have one of the broadcasting towers from the Twin Towers on display, along with a wall of newspapers from around the world from the day after the attack. 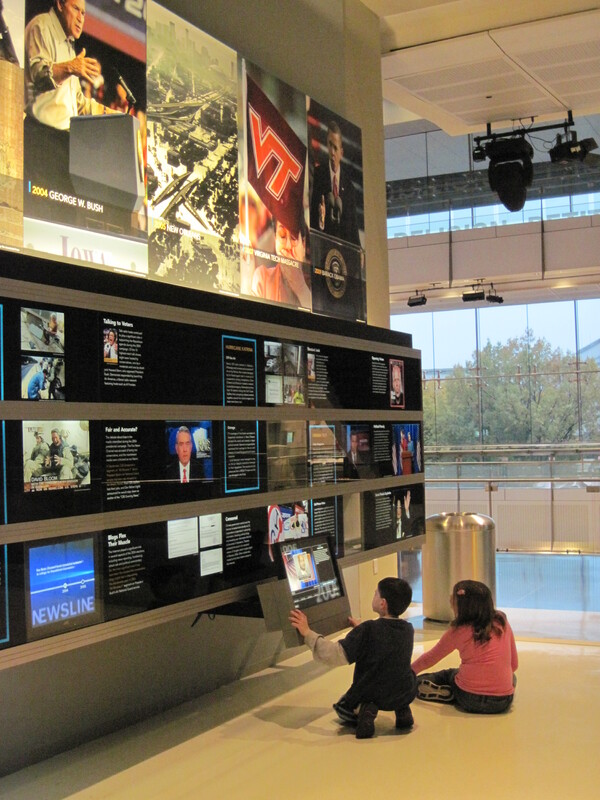 G-Men and Journalists Exhibit – this special exhibit was fascinating, showing the media’s role in federal law enforcement cases like the Unabomber, the Lindburgh baby kidnapping, 9/11 attacks, Waco, and others. 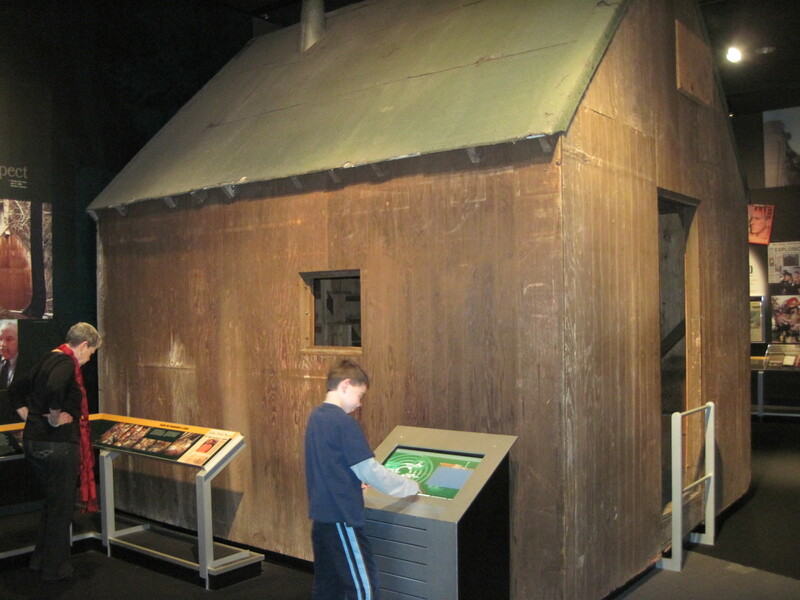 Most interesting are the artifacts, like the Unabomber’s actual cabin that he lived in for 20 years (see above), Richard Reid’s shoe bomb (see below - plus you'll see the matches he used, the tranquilizers used to sedate him after, and his passport), an original final instruction letter to one of the 9/11 hijackers, and engine parts from a plane that hit the Twin Towers. Most chilling was a group of dust-covered cell phones pulled from the rubble, which rescue workers heard ringing for days following the attack. (As for the shoe bomb, we could more easily explain to the kids that this is why we have to remove our shoes when going through security). 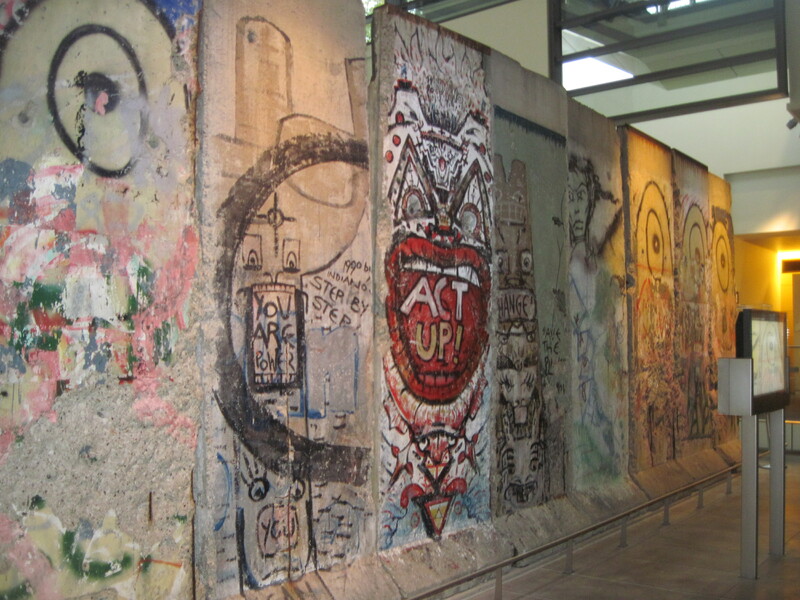 Berlin Wall - see the largest section of Berlin Wall outside of Berlin, plus a guard tower in this exhibit which discusses freedom of speech (and other freedoms) during the times of Berlin's division post World War II. Pulitzer Prize Photos – the Newseum has walls of the Pulitzer Prize winning news photos over the years. Make sure your kids are mature enough to see them – many are horrific. If you have time to watch the videos interviewing the photographers, they’re interesting, explaining how they captured the shot and the stories behind them. This area was a bit much for my kids. 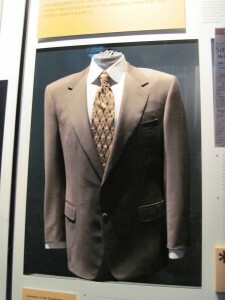 Momentoes: See one of the jacket and ties that OJ Simpson wore during his trial. See the box that Judge Ito used to stop the cameras for showing certain details of the trial. 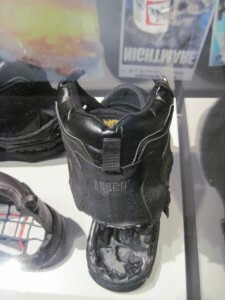 There are a lot of other artifacts sprinkled throughout the museum. 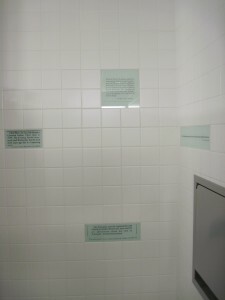 The Bathrooms – again, Not Kidding! 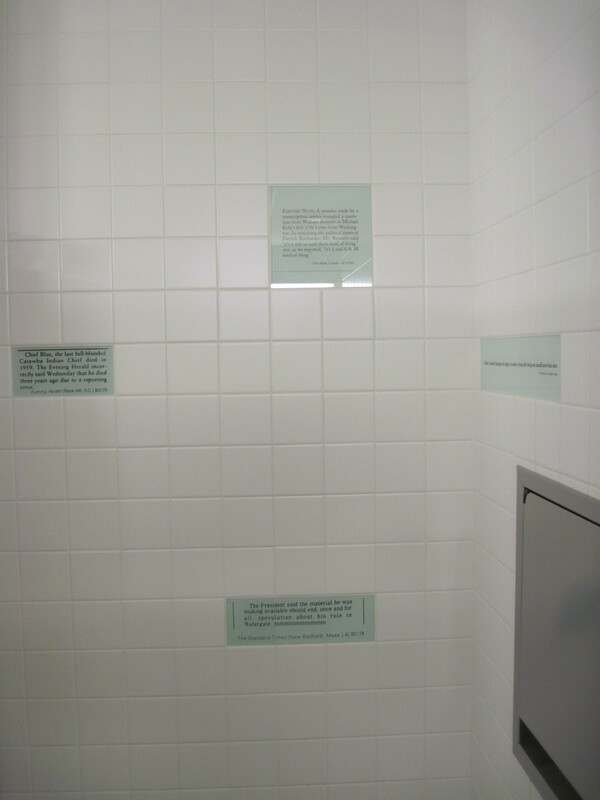 The bathrooms contain newspaper headline bloopers collected by the Columbia Journalism Review. Details: Tickets cost $22/adults, $13 for kids 7-18 (free for kids 6 and under). 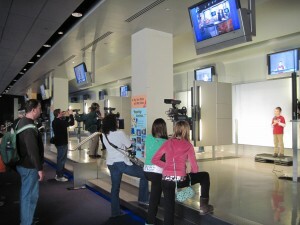 Get a family pass (2 adults, 2 kids) for $50 at the front desk. 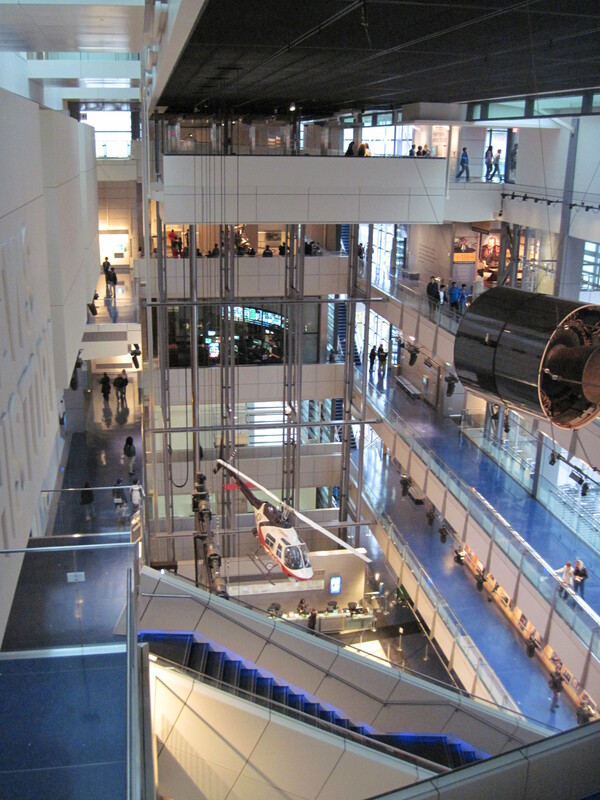 You can get advanced tickets and save 10% online (but you can't get the family pass online). 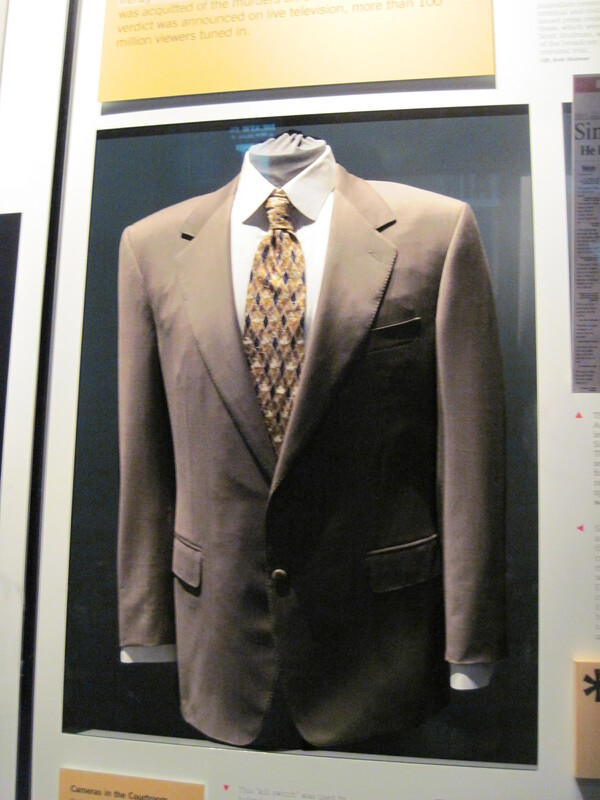 Free coat check. There’s a café inside, with kid-friendly (and adult-friendly) options including salad bar and desserts. Next door is the Source, a Wolfgang Puck restaurant. They make a big deal about the food court food being from his catering arm, but I didn’t think the food court food was “Wolfgang Puck” special. It was just fine. Note that when they search your bags at museum entry, they’ll let you know you can’t eat all that food in your backpack while you’re there. 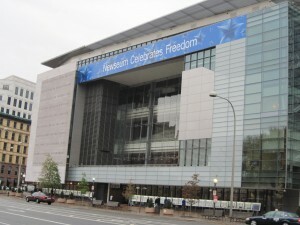 All images are copyrighted to Deborah Abrams Kaplan. No reproduction allowed without written permission. 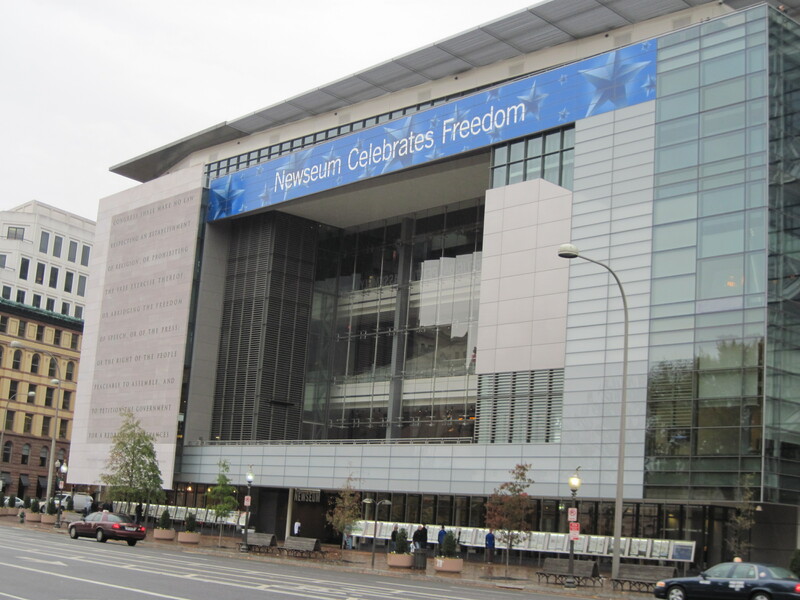 We received press tickets to Newseum, but all opinions are my own.